Raptured and Hypnotized by Jane Fonda! 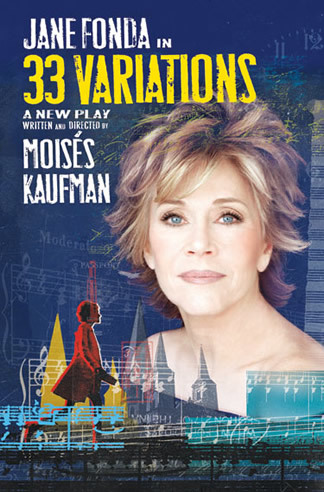 33 Variations and Only One Jane Fonda! I am happy to report that today I had the fortune of witnessing a grand acting dame on stage, live and in her full splendor. Of course, I’m talking about none other than Miss Jane Fonda in Moisés Kaufman’s 33 Variations. Kaufman, a native Venezuelan from Caracas, is best known for The Laramie Project and also Gross Indecency: The Three Trials of Oscar Wilde. Playing in Los Angeles, California at the Ahmanson Theater until March 6, 2011, Jane Fonda brings to life Dr. Katherine Brandt, a victim of Lou Gehrig’s disease, which damages motor neurons in the brain and spinal cord, and who is obsessed with finding out why in 1819 Beethoven accepts a commission by music publisher Anton Diabelli to create a variation of a waltz he had composed. The masterful production takes the viewer into a parallel universe of Beethoven’s compulsive obsession to perfect said waltz, while simultaneously on the stage, Dr. Brandt is on a quest to decipher the motives behind Beethoven’s decision to take on such a commission. The staging and choreography of this production are breathtaking in its elegant simplicity yet inebriating in its thoughtful complexity of dialogue juxtaposition, whereby you are witnessing the inevitable transfiguration of both Beethoven’s and Dr. Brandt’s physical deterioration, while on the other hand we witness the evolution of a classical music masterpiece in the master’s 33 variations of a once simple waltz. Fonda’s characterization of Katherine is mesmerizing when in her decay on stage you can’t help but reminisce about the once vibrant and elastic video fitness guru of the 80’s. Supported by a fabulous cast comprised of Michael Winther as Beethoven, Samantha Mathis as Clara Brandt, Greg Keller as Mike Clark, Don Amendolia as Anton Diabelli, Grant James Varjas as Anton Schindler, and Susan Kellerman as Dr. Ladenburger, 33 Variations is by far one of the best theatrical productions I have seen in recent years. Why you should see it? Duh, because Miss Fonda is in it and it’s a great story and fabulous production. If you like a light comedy with a twist of classical music, then this production is one you should definitely go see before it leaves the stage; I promise you won’t be disappointed one bit. JLo Had Me On The Floor… Dang Gina!